As is his custom, Matt Mullenweg co-founder of WordPress and CEO at Automattic, gave his annual State of the Word presentation at the end of WordCamp US. This gives us a review of where WordPress has been in 2016 and where it’s headed going forward, as a software, community, and a Foundation. You cannot hold a WordCamp on $20 a day alone. The cost isn’t $40; it’s closer to $516 which is made possible by the sponsors and volunteers. 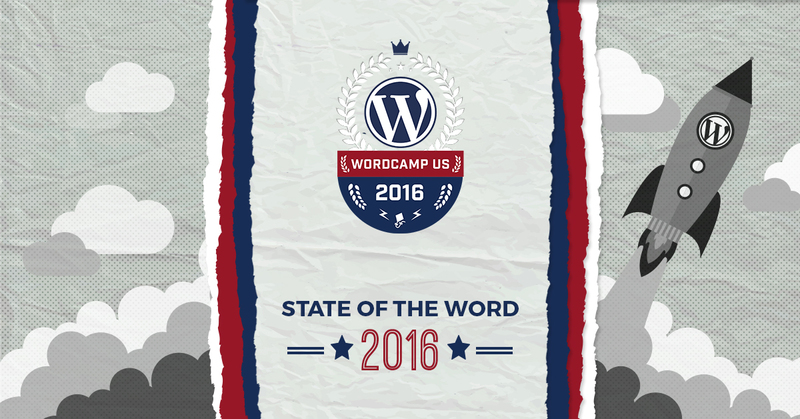 There were 115 WordCamps in 2016 with 41 unique countries and 36,000 people attended with 750 unique organizers and 1,036 sponsors and over 2,000 speakers. As we know, meetups are the groundwork for WordCamps. In 2016, there were 3,193 official Meetup events in 58 countries. And 99.9% of the revenue that runs through the WordPress Foundation is WordCamps. And, what’s more, the presentations at WordCamps are available for anyone to watch on WordPress.tv. This is an untapped resource for beginners in my view and it’s good to see they’re expanding to YouTube as well. WordPress as a software or content management system (CMS) is improved by a team of volunteers and contributors. If you want to begin contributing, forums is a good way to start. The Contributor team is also working on making the plugin repository, often referred to as the repo, more searchable and user friendly. WordPress is working toward making plugins accessible to more languages with the GlotPress team. They’re making progress, but there’s a lot more to do. So if language translation is your thing, this is a good way for you to give back. Security will become important, too. In fact, you will have more options and features if WordPress detects that https is enforced. Though WordPress still has a commitment to backward compatibility, they now suggest running on PHP version 7. We recently made this change on GiveWP.com and the difference is significant. We applaud the move to go forward. For the first time ever, Mullenweg previewed the WordPress Release video and announced the Jazz singer in advance of the release. The audience at the State of the Word learned live that 4.7 would be named after Sarah “Sassy” Vaughn and saw the release video. Lead developer Helen Hou-Sandí talked about the features and themes of WordPress 4.7 including the new default theme “Twenty Seventeen” that is more business-focused. Even the website to the Guggenheim Museum is built using the REST API endpoints. Let’s continue to build the web! Previously, WordPress has been on a release schedule with 3 major releases per calendar year. There have been 14 major releases in the past five years resulting in the growth the market share for WordPress. In 2017, the coming releases will be lead by design and will not have hard dates. They feel it’s important to focus on UI/UX. Matt recognizes the importance of advertising for the growth of WordPress as a CMS and a community. We believe that the move to set up a council is good. Market research and determining how to target both end users and developers has been something we’ve worked on for a few years now. WordPress has grown but can still do so much more. As a plugin development shop, we like where this may be going. We’re interested to see how we can collaborate more as an ecosystem; especially, with sharing benchmarking and indexing data. Our team is very excited about this new development. We’ll be writing more about it in the near future. As you know, Give is our flagship plugin for online donations and donor management. So of course, we’re most excited about the announcement that the WordPress Foundation will partner with more nonprofits. We’re finding that nonprofit work isn’t just a niche, it’s part of all of our lives. Part of the call to democratizing publishing is, in fact, giving a voice to the voiceless. WordPress wants to return to that mission with in-kind grants and scholarships to nonprofits. In 2017, The WordPress Foundation is going to promote hackathons to build sites for nonprofits. We saw a lot of success with groups like Website Weekend in Los Angeles and GiveCamp. As a company, we’re proud to participate with in-kind donations to both of those in 2016. It’s exiciting to see what 2017 will bring with WordPress’ new emphasis on nonprofits. Let’s all continue to press forward, build community, and give a voice to the voiceless.